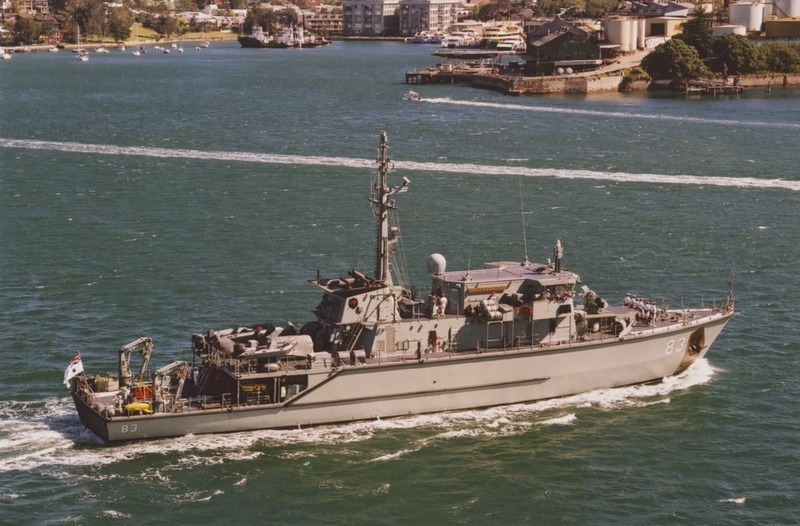 HMAS Hawkesbury (II) was the second of six Huon class minehunter coastal (MHC) vessels built for the Royal Australian Navy by Australian Defence Industries (ADI), Newcastle. The Huon class was the most advanced of its type in the world. Like her sister ships Hawkesbury was made of fibre reinforced plastic and had a unique single skin solid hull that had no ribs or frames, providing high underwater shock resistance, and very low magnetic and noise levels. This hull was designed to flex inwards if an undersea explosion occurred nearby. All machinery and equipment was mounted on cradles or suspended from bulkheads to further enhance resistance to shock damage and protect ship systems. HMAS Hawkesbury (II) was the second RAN ship to carry the name of the large NSW river. HMAS Hawkesbury (II) on the day of her launching in April 1998. She was launched on 24 April 1998 by Mrs Jennifer Smyth, the wife of Commodore Dacre Smyth AO, RAN, a former Commanding Officer of HMAS Hawkesbury (I). 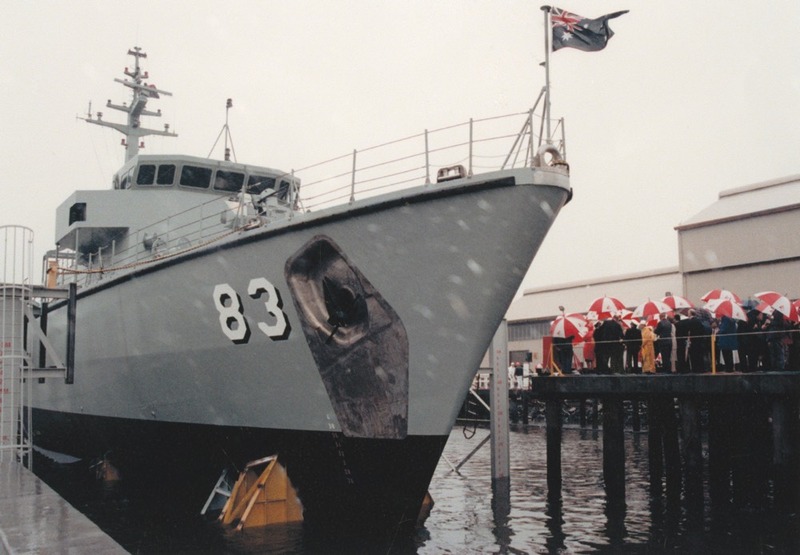 Following sea trials that included a series of carefully controlled underwater explosions to prove her ability to withstand shocks associated with mine clearance operations, Hawkesbury commissioned into the RAN under the command of Lieutenant Commander Steve McCarey, RAN, at HMAS Waterhen on 12 February 2000 with cadets from TS Hawkesbury involved in the ceremony. Following a brief period of sea checks, mine hunting exercises began in March. Following just a year of operational service Hawkesbury was awarded the Kelly Shield for small ship efficiency in 2001. 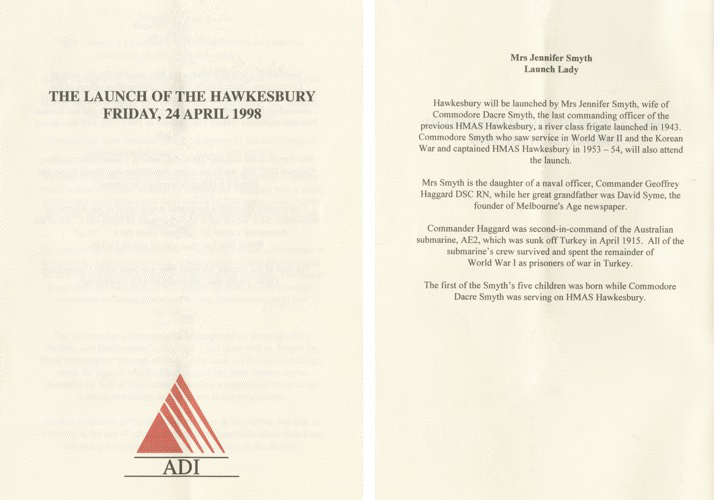 Left: Booklet from the launch of HMAS Hawkesbury (II) on 24 April 1998. Right: Information about the launching lady, Mrs Jennifer Smyth (taken from the launch booklet). 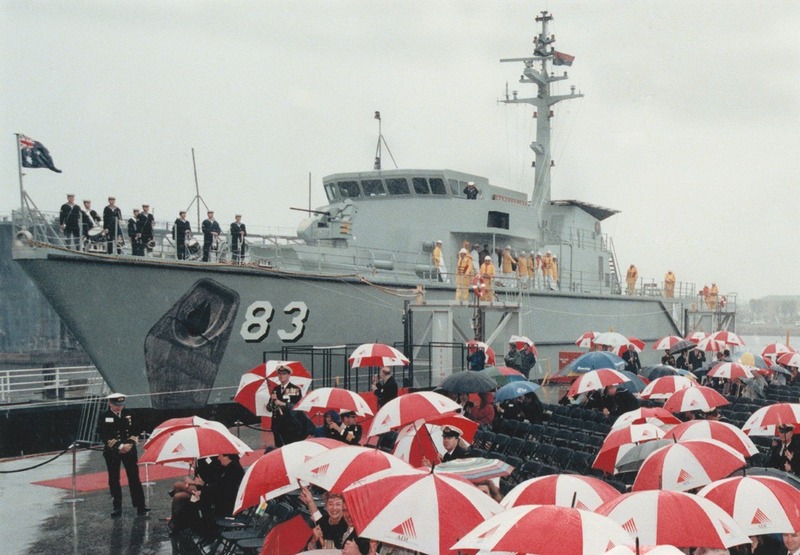 Hawkesbury's crew parade in drizzling rain on the day of her Commissioning at HMAS Waterhen on 12 February 2000. 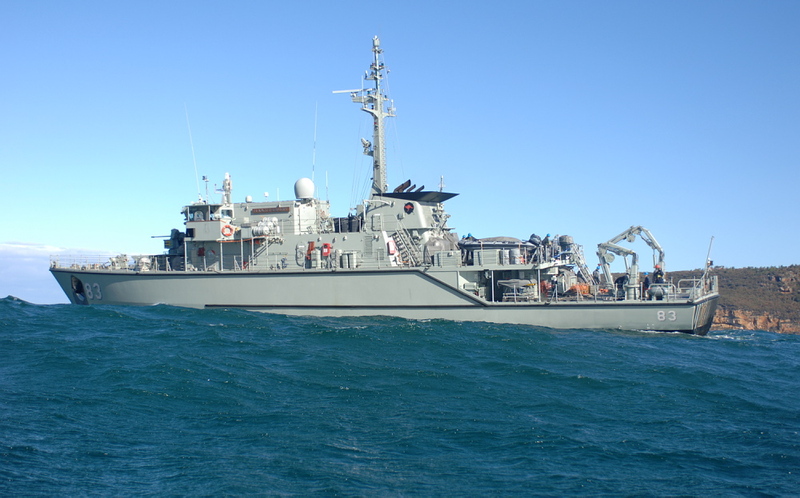 Hawkesbury was a regular participant in fleet exercises in the first few years of her commission and took part in; a Fleet Concentration Period and Exercise HUNTER in 2000; Exercise TANDEM THRUST and a Minor War Vessel Concentration Period in 2001; Exercises MULGOGGER and DUGONG in 2002; Exercises MULGOGGER, TALISMAN SABRE and DUGONG in 2005; and Exercises OCEAN PROTECTOR and MULGOGGER in 2006. 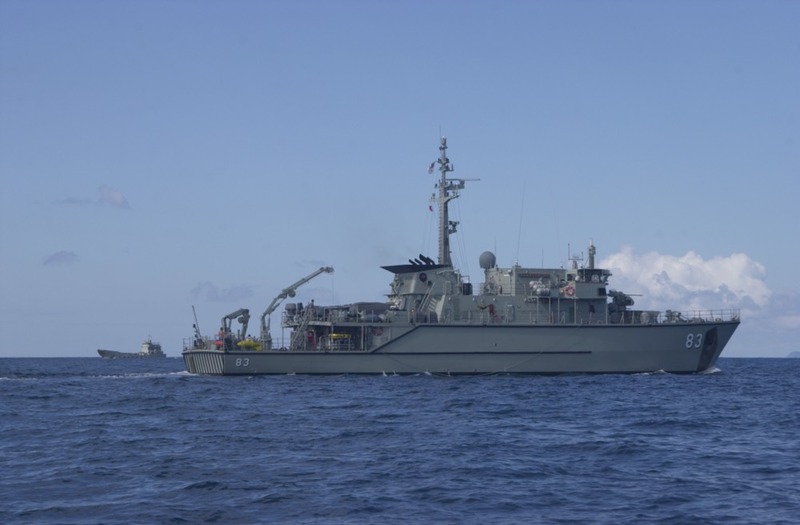 She also conducted surveillance operations around the Bass Strait oil rigs in support of Operation ESTES. Hawkesbury operating in company with one of the RAN's Landing Craft Heavy during Exercise TANDEM THRUST 2001. Hawkesbury visited South East Asia on three occasions in; July/August 2000; June/July 2001 when she participated in the Western Pacific Mine Counter-Measures Exercise; and August/ September 2004 when she participated in Exercise BERSAMA LIMA. She visited the western South Pacific in May/June 2002 when the ship's demolition and diving teams, at the request of the Tongan Port Authority, destroyed some underwater obstructions in the main shipping channel into Nuku'alofa Harbour; and she also twice visited New Zealand in May/June 2003 and September/October 2005. In August 2002 the ship came to the assistance of RV Lady Bastion in North Queensland waters when one of the research vessel's crew members experienced heart problems. Hawkesbury transported the sailor to Sunday Island where he was transferred to a Careflight helicopter for transport to Thursday Island. In 2003 Hawkesbury deployed to the Solomon Islands in support of Operation ANODE, the Australian Defence Force contribution to the Australian-led Regional Assistance Mission to the Solomon Islands (RAMSI). RAMSI's mission was to assist the Government of the Solomon Islands in the maintenance of security, economic governance and improving the machinery of government. Hawkesbury was the first Huon class MHC to undertake an operational deployment. On 12 August the ship transported a critically ill two-month old baby and the child's mother from Taro to Ghizo. Fortuitously, shortly after departing Ghizo, two men were spotted floating at sea some 6nm west of Ghizo Island. A search and rescue mission was immediately initiated and over the next two hours six men were rescued from the water. The men were travelling from Lale to Ghizo in a 23-foot powered canoe when their vessel was swamped and sunk. The rescue was not without excitement as Able Seaman Wayne Broad was forced to open fire on a shark which was posing a threat to one of the men in the water. The six men were landed at Ghizo. A second planned deployment to the Solomons was cancelled in October 2004. HMAS Hawkesbury (II) in Sydney Harbour. Hawkesbury commenced Operation RESOLUTE patrols in August 2006. That month the ship conducted her first boarding and apprehension of a foreign fishing vessel illegally fishing within Australia's Exclusive Economic Zone. RESOLUTE remained Hawkesbury's main operational commitment until the end of 2008. Hawkesbury was also occasionally employed in hydrographic work conducting routine survey operations in and around Port Phillip Bay and Darwin Harbour. She also participated in inconclusive surveys over the possible wreck site of AHS Centaur off the south Queensland coast. 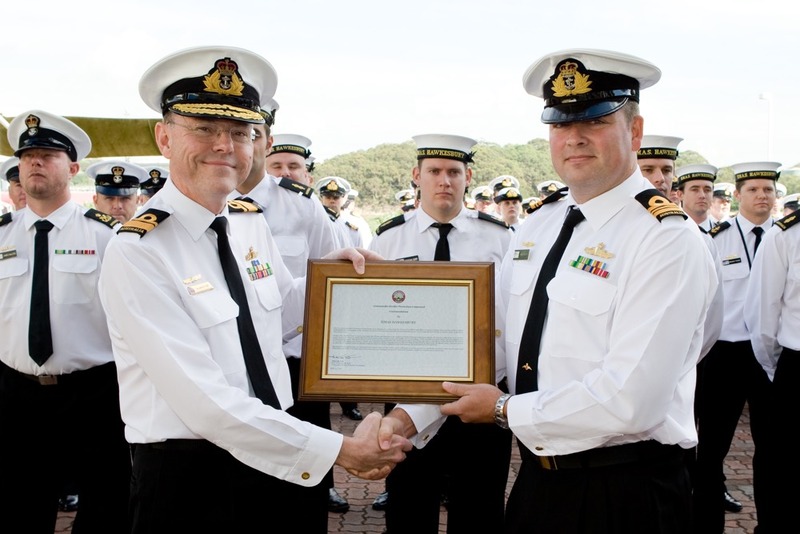 Commander Border Protection Command, Rear Admiral Allan du Toit, AM, RAN, (left) presents a Commendation to the Commanding Officer of HMAS Hawkesbury (II), Lieutenant Commander Ben Esler, RAN, for the ship's company's contribution to border security, 23 April 2009. In June 2009 it was decided that two MHCs would be placed into an Extended Readiness Availability. The two ships selected were Hawkesbury and HMAS Norman (II). The decision effectively brought to an end Hawkesbury's operational career. She remained alongside at Waterhen until decommissioning on 31 October 2018. Left: Mine Hunter Coastal HMAS Hawkesbury (83), HMAS Norman (84) and HMAS Gascoyne (85) in the dry dock at Fleet Base East, Garden Island, 19 August 2010. Right: Divers from Australian Clearance Diving Team One prepare to enter HMAS Hawkesbury (II) while Chief Petty Officer Clearance Diver Darren Smith (centre) talks with Commander Australian Fleet, Rear Admiral Tim Barrett AM, CSC, RAN (right), through the steps required and the thought processes involved in during this part of the scenario, 18 July 2013.